A financial endowment is a donation of money or property to a nonprofit organization which uses the resulting investment income for a specific purpose. Usually the endowment is structured so that the principal amount is kept intact, while the investment income is available for use, or part of the principal is released each year, which allows for their donation to have an impact over a longer period than if it were spent all at once. An endowment may come with stipulations regarding its usage. The total value of an institution's investments is often referred to as the institution's endowment and is typically organized as a public charity, private foundation, or trust. Among the institutions that commonly manage endowments are academic institutions (e.g., colleges, universities, and private schools), cultural institutions (e.g., museums, libraries, and theaters), service organizations (e.g., hospitals, retirement homes, the Red Cross, the SPCA), and religious organizations (e.g., churches, synagogues, mosques). The earliest "endowed chairs" were those established by the Roman emperor and Stoic philosopher Marcus Aurelius in Athens in AD 176. Aurelius created one endowed chair for each of the major schools of philosophy: Platonism, Aristotelianism, Stoicism, and Epicureanism. Later, similar endowments were set up in some other major cities of the Empire. The practice was adapted to the modern university system beginning in England in 1502, when Lady Margaret Beaufort, Countess of Richmond and grandmother to the future king Henry VIII, created the first endowed chairs in divinity at the universities of Oxford (Lady Margaret Professor of Divinity) and Cambridge (Lady Margaret's Professor of Divinity). Nearly 50 years later, Henry VIII established the Regius Professorships at both universities, this time in five subjects: divinity, civil law, Hebrew, Greek, and physic—the last of those corresponding to what are now known as medicine and basic sciences. Today, the University of Glasgow has fifteen Regius Professorships. Private individuals soon adopted the practice of endowing professorships. 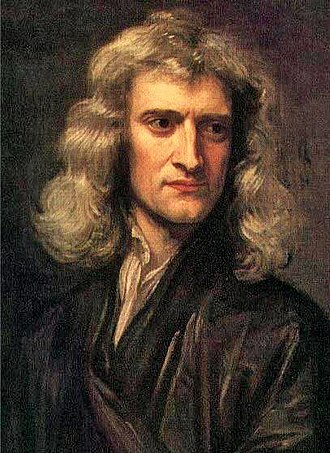 Isaac Newton held the Lucasian Chair of Mathematics at Cambridge beginning in 1669, more recently held by the celebrated physicist Stephen Hawking. Unrestricted endowment can be used in any way the recipient chooses to carry out its mission. Term endowment funds stipulate that all or part of the principal may be expended only after the expiration of a stated period of time or occurrence of a specified event, depending on donor wishes. Quasi endowment funds must retain the purpose and intent as specified by the donor or source of the original funds and earnings may be expended only for the specified purpose. Endowment revenue can be restricted by donors to serve many purposes. Endowed professorships or scholarships restricted to a particular subject are common; in some places a donor could fund a trust exclusively for the support of a pet. Ignoring the restriction is called "invading" the endowment. But change of circumstance or financial duress like bankruptcy can preclude carrying out the donor's intent. A court can alter the use of restricted endowment under a doctrine called cy-près meaning to find an alternative "as near as possible" to the donor's intent. The restricted/unrestricted distinction focuses on the use of the funds; see quasi-endowment below for a distinction about whether principal can be spent. Academic institutions, such as colleges and universities, will frequently control an endowment fund that finances a portion of the operating or capital requirements of the institution. In addition to a general endowment fund, each university may also control a number of restricted endowments that are intended to fund specific areas within the institution. The most common examples are endowed professorships (also known as named chairs), and endowed scholarships or fellowships. In the United States, the endowment is often integral to the financial health of educational institutions. Alumni or friends of institutions sometimes contribute capital to the endowment. The use of endowment funding is strong in the United States and Canada but less commonly found outside of North America, with the exceptions of Cambridge and Oxford universities. Endowment funds have also been created to support secondary and elementary school districts in several states in the United States. An endowed professorship (or endowed chair) is a position permanently paid for with the revenue from an endowment fund specifically set up for that purpose. Typically, the position is designated to be in a certain department. The donor might be allowed to name the position. 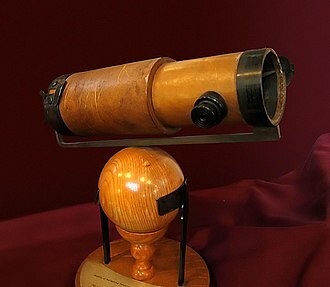 Endowed professorships aid the university by providing a faculty member who does not have to be paid entirely out of the operating budget, allowing the university to either reduce its student-to-faculty ratio, a statistic used for college rankings and other institutional evaluations, and/or direct money that would otherwise have been spent on salaries toward other university needs. In addition, holding such a professorship is considered to be an honour in the academic world, and the university can use them to reward its best faculty or to recruit top professors from other institutions. An endowed scholarship is tuition (and possibly other cost) assistance that is permanently paid for with the revenue of an endowment fund specifically set up for that purpose. It can be either merit-based or need-based (which is only awarded to those students for whom the college expense would cause their family financial hardship) depending on university policy or donor preferences. Some universities will facilitate donors' meeting the students they are helping. The amount that must be donated to start an endowed scholarship can vary greatly. Fellowships are similar, although they are most commonly associated with graduate students. In addition to helping with tuition, they may also include a stipend. Fellowships with a stipend may encourage students to work on a doctorate. Frequently, teaching or working on research is a mandatory part of a fellowship. A financial endowment is typically overseen by a board of trustees and managed by a trustee or team of professional managers. Typically, the financial operation of the endowment is designed to achieve the stated objectives of the endowment. At universities, typically 4–6% of the endowment's assets are spent every year to fund operations or capital spending. Any excess earnings are typically reinvested to augment the endowment and to compensate for inflation and recessions in future years. This spending figure represents the proportion that historically could be spent without diminishing the principal amount of the endowment fund. 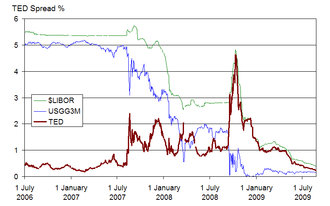 However, the financial crisis of 2007–2010 had a major impact on the entire range of endowments globally. Most notably, large U.S.-based college and university endowments, which had posted large, highly publicized gains in the 1990s and 2000s faced significant losses of principal across a range of investments. 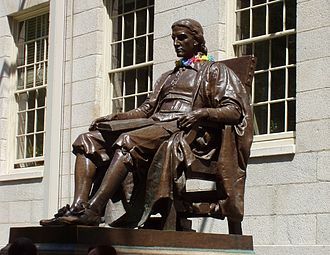 The Harvard University endowment fund, which held $37 billion on June 30, 2008, was reduced to $26 billion during the following year. Yale University, the pioneer of an approach that involved investing heavily in alternative investments such as real estate and private equity, reported an endowment of $16 billion as of September 2009, a 30% annualized loss that was more than predicted in December 2008. 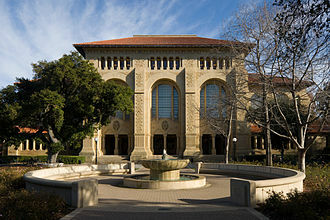 At Stanford University, the endowment was reduced from about $17 billion to $12 billion as of September 2009. Brown University's endowment fell 27 percent to $2.04 billion in the fiscal year that ended June 30, 2009. George Washington University lost 18% in that same fiscal year, down to $1.08 billion. In Canada, after the financial crisis in 2008, University of Toronto reported a loss of 31% ($545 million) of its previous year-end value in 2009. The loss is attributed to over-investment in hedge funds. A quasi-endowment, or fund functioning as an endowment, are funds merely earmarked by an organization's governing board, rather than restricted by a donor or other outside agency, to be invested to provide income for a long but unspecified period, and the governing board has the right to decide at any time to expend the principal of such funds. Separately from the endowment versus quasi-endowment distinction, there's another 2-way categorization of restricted and unrestricted, which focuses on the use of the funds. As an example, a quasi-endowment might be restricted by the donor to supporting the tennis team; the use is restricted to one purpose, but the governing board could "invade principal" to support the tennis team. ^ Kenton, Will. "Endowment". Investopedia. ^ Frede, Dorothea (2009). "Alexander of Aphrodisias > 1.1 Date, Family, Teachers, and Influence". Stanford Encyclopedia of Philosophy. Stanford University. Retrieved 6 September 2012. ^ Lynch, John Patrick (1972). 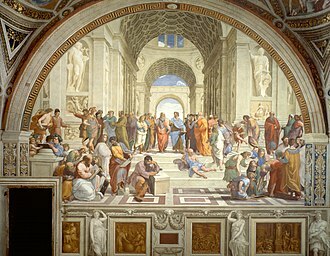 Aristotle's school; a study of a Greek educational institution. University of California Press. pp. 19––207, 213–216. ISBN 9780520021945. ^ Lady Margaret's 500‑year legacy Archived 2007-05-16 at the Wayback Machine – University of Cambridge. ^ Bruen, Robert (May 1995). "A Brief History of The Lucasian Professorship of Mathematics at Cambridge University". Robert Bruen. Archived from the original on 24 August 2012. Retrieved 6 September 2012. ^ Ashlea Ebelling (January 13, 2010). "Caring For Fido After You're Gone". Forbes. Archived from the original on April 2, 2015. Retrieved March 5, 2015. ^ Dhanya Ann Thoppil (February 19, 2015). "Monkey to Inherit House, Garden, Trust Fund – India Real Time". The Wall Street Journal. Archived from the original on February 22, 2015. Retrieved March 5, 2015. ^ a b Patrick Sullivan (June 12, 2012). 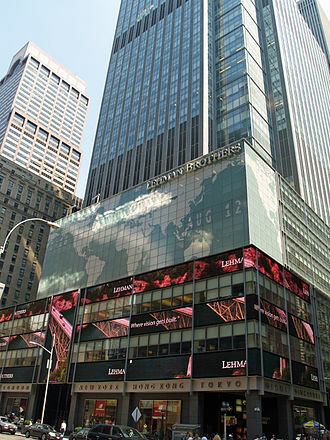 "Bankrupt But Endowed – The NonProfit TimesThe NonProfit Times". Thenonprofittimes.com. Archived from the original on April 2, 2015. Retrieved March 5, 2015. ^ Kansas incorporated its first public school district endowment association in Paola, Kansas, a small town of 5,000 people, in 1983. Today, it has approximately $2 million in endowed principal, which generates approximately $110,000 annually to distribute in scholarships to high school graduates and fund special projects in the district, which can not be afforded by the tax base. To promote the development of endowment associations across Kansas, USD 368 Endowment Association, which received a statewide award recognizing, has developed a "starter kit" to assist other Kansas school districts in the organization and establishment of new endowment associations. ^ "SO NICELY ENDOWED!". newsweek.com. 31 July 2004. Retrieved 14 April 2018. ^ "404. Page Not Found - Bloomberg". Bloomberg.com. Retrieved 14 April 2018. ^ Burrows, Malcom D. (2010). "The End of Endowments?". The Philanthropist. 23 (1): 52–61. ^ "Not-for-Profit Organizations". AICPA Audit and Accounting Guide. American Institute of Certified Public Accountants: 367. May 1, 2007. Newfield, Christopher (2008). Unmaking the public university: the forty-year assault on the middle class. Harvard University Press. 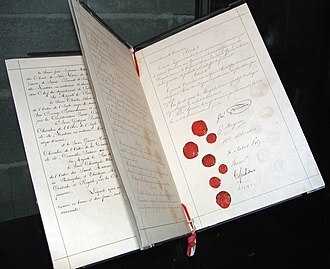 p. 162. ISBN 978-0-674-02817-3. Dada, Kamil (February 1, 2008). "Congress investigates endowment". Stanford Daily. Archived from the original on June 9, 2011. 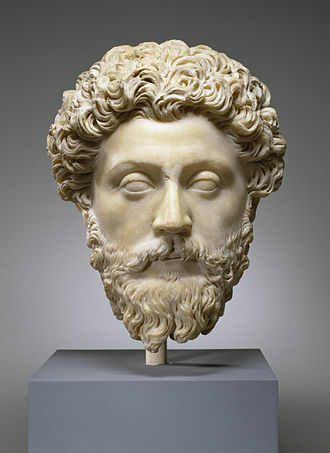 Marcus Aurelius was Emperor of Rome from 161 to 180. 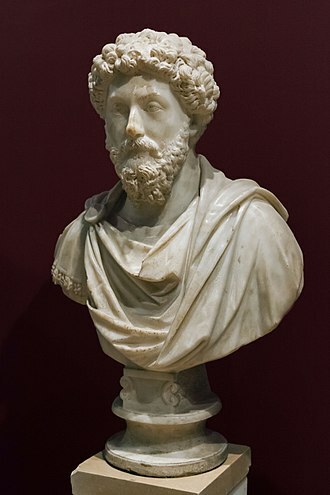 He ruled with Lucius Verus as co-emperor from 161 until Verus death in 169, Marcus Aurelius was the last of the so-called Five Good Emperors. He was a practitioner of Stoicism, and his untitled writing, during his reign, the Roman Empire defeated a revitalized Parthian Empire in the East, Aurelius general Avidius Cassius sacked the capital Ctesiphon in 164. A revolt in the East led by Avidius Cassius failed to gain momentum and was suppressed immediately, the major sources for the life and rule of Marcus Aurelius are patchy and frequently unreliable. For Marcus life and rule, the biographies of Hadrian, Antoninus Pius and Lucius Verus are largely reliable, a body of correspondence between Marcus tutor Fronto and various Antonine officials survives in a series of patchy manuscripts, covering the period from c.138 to 166. Marcus own Meditations offer a window on his life, but are largely undateable. The main narrative source for the period is Cassius Dio, a Greek senator from Bithynian Nicaea who wrote a history of Rome from its founding to 229 in eighty books. Dio is vital for the history of the period, but his senatorial prejudices. Inscriptions and coin finds supplement the literary sources, Marcus family originated in Ucubi, a small town southeast of Córdoba in Iberian Baetica. 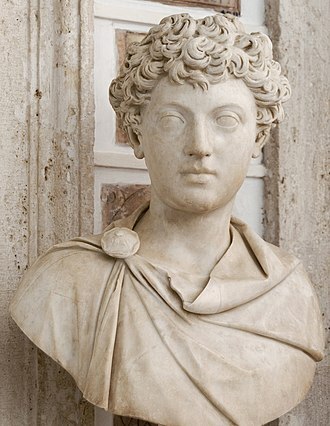 Verus elder son—Marcus Aurelius father—Marcus Annius Verus married Domitia Lucilla, Lucilla was the daughter of the patrician P. Calvisius Tullus Ruso and the elder Domitia Lucilla. The elder Domitia Lucilla had inherited a fortune from her maternal grandfather and her paternal grandfather by adoption. Lucilla and Verus had two children, a son, born on 26 April 121 AD, and a daughter, Annia Cornificia Faustina, Verus probably died in 124 AD, during his praetorship, when Marcus was only three years old. 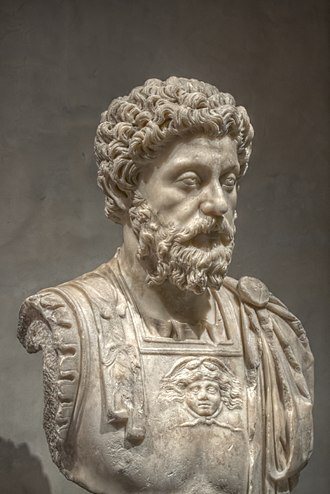 Though he can hardly have known him, Marcus Aurelius wrote in his Meditations that he had learned modesty and manliness from his memories of his father, following prevailing aristocratic customs, probably did not spend much time with her son. 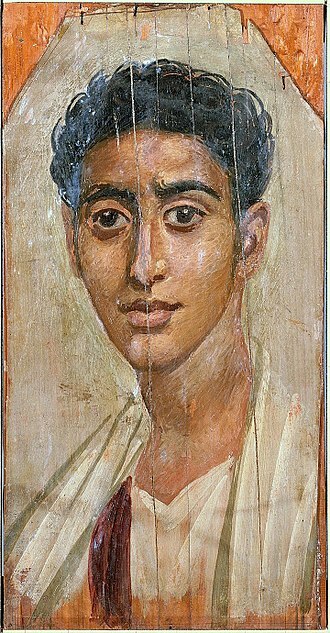 Marcus was in the care of nurses, even so, Marcus credits his mother with teaching him religious piety, simplicity in diet and how to avoid the ways of the rich. Brown is the seventh-oldest institution of higher education in the United States and one of the nine Colonial Colleges established before the American Revolution. At its foundation, Brown was the first college in the United States to accept students regardless of their religious affiliation and its engineering program was established in 1847 and was the first in the Ivy League. It was one of the early doctoral-granting U. S. institutions in the late 19th century, adding master, Browns New Curriculum is sometimes referred to in education theory as the Brown Curriculum and was adopted by faculty vote in 1969 after a period of student lobbying. 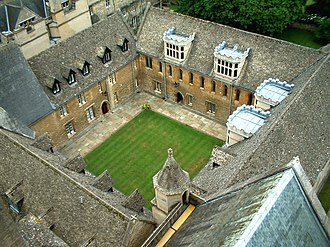 In 1971, Browns coordinate womens institution Pembroke College was fully merged into the university, Pembroke Campus now operates as a place for dorms and classrooms. Undergraduate admissions is very selective, with a rate of 8.3 percent for the class of 2021. The University comprises The College, the Graduate School, Alpert Medical School, the School of Engineering, the School of Public Health, and the School of Professional Studies. The Brown/RISD Dual Degree Program, offered in conjunction with the Rhode Island School of Design, is a course that awards degrees from both institutions. Browns main campus is located in the College Hill Historic District in the city of Providence, the Universitys neighborhood is a federally listed architectural district with a dense concentration of Colonial-era buildings. On the western edge of the campus, Benefit Street contains one of the finest cohesive collections of restored seventeenth-, Browns faculty and alumni include eight Nobel Prize laureates, five National Humanities Medalists, and ten National Medal of Science laureates. Other notable alumni include eight billionaire graduates, a U. S. Supreme Court Chief Justice, to erect a public Building or Buildings for the boarding of the youth & the Residence of the Professors. 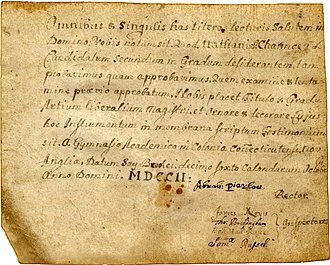 Stiles and Ellery were co-authors of the Charter of the College two years later, there is further documentary evidence that Stiles was making plans for a college in 1762. On January 20, Chauncey Whittelsey, pastor of the First Church of New Haven, answered a letter from Stiles, should you make any Progress in the Affair of a Colledge, I should be glad to hear of it, I heartily wish you Success therein. Isaac Backus was the historian of the New England Baptists and an inaugural Trustee of Brown, Mr. James Manning, who took his first degree in New-Jersey college in September,1762, was esteemed a suitable leader in this important work. Manning arrived at Newport in July 1763 and was introduced to Stiles, stiless first draft was read to the General Assembly in August 1763 and rejected by Baptist members who worried that the College Board of Fellows would under-represent the Baptists. 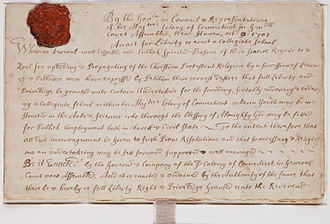 A revised Charter written by Stiles and Ellery was adopted by the Assembly on March 3,1764, in September 1764, the inaugural meeting of the College Corporation was held at Newport. Governor Stephen Hopkins was chosen chancellor and future governor Samuel Ward was vice chancellor, John Tillinghast treasurer, the Charter stipulated that the Board of Trustees be composed of 22 Baptists, five Quakers, five Episcopalians, and four Congregationalists. The University of Glasgow is the fourth oldest university in the English-speaking world and one of Scotlands four ancient universities. Along with the University of Edinburgh, the University was part of the Scottish Enlightenment during the 18th century and it is currently a member of Universitas 21, the international network of research universities, and the Russell Group. Glasgow University served all of students by preparing them for professions, the law, civil service, teaching. It trained smaller but growing numbers for careers in science, originally located in the citys High Street, since 1870 the main University campus has been located at Gilmorehill in the West End of the city. Additionally, a number of university buildings are located elsewhere, such as the Veterinary School in Bearsden, and it is the second-oldest university in Scotland after St Andrews and the fourth-oldest in the English-speaking world. The universities of St Andrews and Aberdeen were ecclesiastical foundations, as one of the Ancient Universities of the United Kingdom, Glasgow University is one of only eight institutions to award undergraduate masters degrees in certain disciplines. 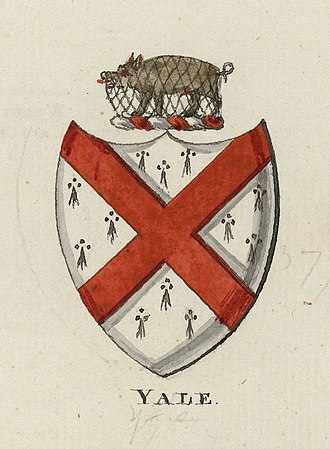 The University has been without its original Bull since the mid-sixteenth century, in 1560, during the political unrest accompanying the Scottish Reformation, the chancellor, Archbishop James Beaton, a supporter of the Marian cause, fled to France. He took with him, for safe-keeping, many of the archives and valuables of the Cathedral and the University, including the Mace, although the Mace was sent back in 1590, the archives were not. If they had not been lost by time, they certainly went astray during the French Revolution when the Scots College was under threat. Its records and valuables were moved for safe-keeping out of the city of Paris, the Bull remains the authority by which the University awards degrees. Teaching at the University began in the chapterhouse of Glasgow Cathedral, subsequently moving to nearby Rottenrow, the University was given 13 acres of land belonging to the Black Friars on High Street by Mary, Queen of Scots, in 1563. The Lion and Unicorn Staircase was transferred from the old site and is now attached to the Main Building. The donated assets may be held by a charitable trust. The person making such dedication is known as waqif, a donor, in Ottoman Turkish law, and under the British Mandate of Palestine, the waqf was defined as usufruct State land of which the State revenues are assured to pious foundations. In Sunni jurisprudence, spelled wakf is synonymous with ḥabs and similar terms are used mainly by Maliki jurists. In Twelver Shiism, ḥabs is a type of waqf. The person making the grant is called al-waqif while the endowed assests are called al-mawquf, the term waqf literally means confinement and prohibition or causing a thing to stop or stand still. Bahaeddin Yediyıldız defines the waqf as a system which comprises three elements, hayrat and waqf, there is no direct injunction of the Quran regarding Waqf, which is derived from a number of hadiths. One says, Ibn Umar reported, Umar Ibn Al-Khattab got land in Khaybar, so he came to the prophet Muhammad, the Prophet said, If you like, make the property inalienable and give the profit from it to charity. It goes on to say that Umar gave it away as alms and he gave it away for the poor, the relatives, the slaves, the jihad, the travelers and the guests. And it will not be held against him who administers it if he consumes some of its yield in a manner or feeds a friend who does not enrich himself by means of it. In another hadith, Muhammad said, When a man dies, Islamic law puts several legal conditions on the process of establishing a waqf. A waqf is a contract, therefore the founder must be of the capacity to enter into a contract, finally if a person is fatally ill, the waqf is subject to the same restrictions as a will in Islam. The property used to found a waqf must be objects of a valid contract, the object should not be illegal in Islam. Finally these objects should not already be in the public domain, public property cannot be used to establish a waqf. The founder cannot have pledged the property previously to someone else and these conditions are generally true for contracts in Islam. The George Washington University is a private research university in Washington, D. C. GW is the largest institution of education in Washington, D. C. In his will, Washington left his 50 shares in the Potomac Company to help endow the university, due to the companys financial difficulties, the funding did not materialize. The university was chartered by an act of Congress on February 9,1821 and its name was changed to Columbian University in 1873 and to the George Washington University in 1904, in honor of Washington. GWs Graduate School of Political Management is the school of applied politics in the nations capital. GWs professional schools and the Elliott School of International Affairs are consistently ranked highly in national and international college rankings lists, the Princeton Review consistently ranks GW as one of the Most Politically Active schools. Some of the graduates have gone on to high positions within both the U. S. government and foreign governments. Notable alumni include former Senate Minority Leader Harry Reid, former Secretary of State Colin Powell and he presented numerous letters to Congress and included the subject in his last will and testament. Baptist missionary and leading minister Luther Rice raised funds to purchase a site in Washington, the first commencement in 1824 was considered an important event for the young city of Washington, D. C. In attendance were President Monroe, John C, Henry Clay, Marquis de Lafayette and other dignitaries. During the Civil War, most students left to join the Confederacy, walt Whitman was among many of the volunteers to work on the campus. Following the war, in 1873, Columbian College became the Columbian University and moved to a downtown location centered on 15th and H streets. The university moved its operations to the D. C. neighborhood of Foggy Bottom in 1912. The George Washington University, like much of Washington, D. C. traces many of its origins back to the Freemasons, the Bible that the presidents of the university use to swear an oath on upon inauguration is the Bible of Freemason George Washington. Freemasonry symbols are displayed throughout the campus including the foundation stones of many of the university buildings. Stanford University, officially Leland Stanford Junior University, is a private research university in Stanford, adjacent to Palo Alto and between San Jose and San Francisco. Its 8, 180-acre campus is one of the largest in the United States, Stanford has land and facilities elsewhere. The university was founded in 1885 by Leland and Jane Stanford in memory of their only child, Stanford was a former Governor of California and U. S. Senator, he made his fortune as a railroad tycoon. 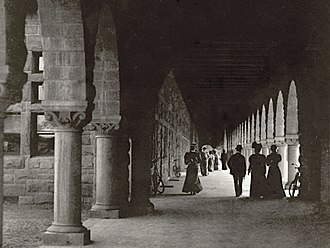 The school admitted its first students 125 years ago on October 1,1891, Stanford University struggled financially after Leland Stanfords death in 1893 and again after much of the campus was damaged by the 1906 San Francisco earthquake. Following World War II, Provost Frederick Terman supported faculty and graduates entrepreneurialism to build self-sufficient local industry in what would be known as Silicon Valley. The university is one of the top fundraising institutions in the country. There are three schools that have both undergraduate and graduate students and another four professional schools. Students compete in 36 varsity sports, and the university is one of two institutions in the Division I FBS Pac-12 Conference. Stanford faculty and alumni have founded a number of companies that produce more than $2.7 trillion in annual revenue. It is the alma mater of 30 living billionaires,17 astronauts and it is one of the leading producers of members of the United States Congress. Sixty Nobel laureates and seven Fields Medalists have been affiliated with Stanford as students, Stanford University was founded in 1885 by Leland and Jane Stanford, dedicated to Leland Stanford Jr, their only child. The institution opened in 1891 on Stanfords previous Palo Alto farm, despite being impacted by earthquakes in both 1906 and 1989, the campus was rebuilt each time. In 1919, The Hoover Institution on War and Peace was started by Herbert Hoover to preserve artifacts related to World War I, the Stanford Medical Center, completed in 1959, is a teaching hospital with over 800 beds. The SLAC National Accelerator Laboratory, which was established in 1962, in 2008, 60% of this land remained undeveloped. Hawking was the first to set forth a theory of cosmology explained by a union of the general theory of relativity and quantum mechanics. He is a supporter of the many-worlds interpretation of quantum mechanics. 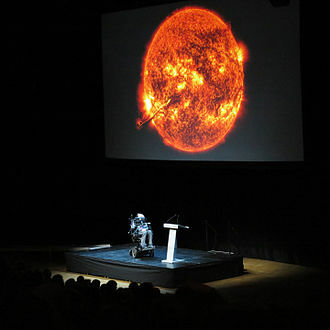 In 2002, Hawking was ranked number 25 in the BBCs poll of the 100 Greatest Britons, Hawking has a rare early-onset, slow-progressing form of amyotrophic lateral sclerosis that has gradually paralysed him over the decades. He now communicates using a single cheek muscle attached to a speech-generating device, Hawking was born on 8 January 1942 in Oxford, England to Frank and Isobel Hawking. 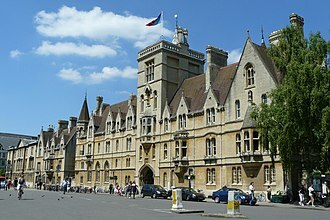 Despite their families financial constraints, both attended the University of Oxford, where Frank read medicine and Isobel read Philosophy. The two met shortly after the beginning of the Second World War at a research institute where Isobel was working as a secretary. They lived in Highgate, but, as London was being bombed in those years, Hawking has two younger sisters and Mary, and an adopted brother, Edward. In 1950, when Hawkings father became head of the division of parasitology at the National Institute for Medical Research and his moved to St Albans. In St Albans, the family were considered intelligent and somewhat eccentric. They lived an existence in a large and poorly maintained house. During one of Hawkings fathers frequent absences working in Africa, the rest of the family spent four months in Majorca visiting his mothers friend Beryl and her husband, Hawking began his schooling at the Byron House School in Highgate, London. He blamed its progressive methods for his failure to learn to read while at the school, in St Albans, the eight-year-old Hawking attended St Albans High School for Girls for a few months. At that time, younger boys could attend one of the houses, the family placed a high value on education. Hawkings father wanted his son to attend the well-regarded Westminster School and his family could not afford the school fees without the financial aid of a scholarship, so Hawking remained at St Albans. 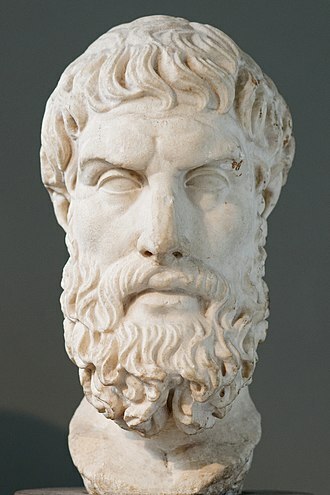 Platonism, rendered as a proper noun, is the philosophy of Plato or the name of other philosophical systems considered closely derived from it. Lower case platonists need not accept any of the doctrines of Plato, in a narrower sense, the term might indicate the doctrine of Platonic realism. 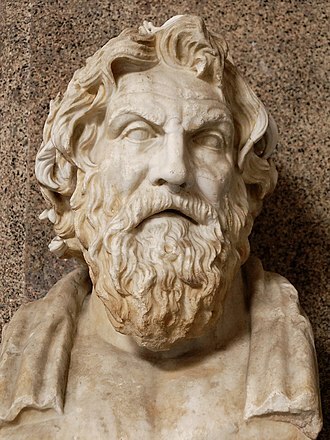 The forms are described in dialogues such as the Phaedo, Symposium. In the Republic the highest form is identified as the Form of the Good, the source of all other forms, in the Sophist, a work, the forms being and difference are listed among the primordial Great Kinds. The primary concept is the Theory of Forms, the only true being is founded upon the forms, the eternal, perfect types, of which particular objects of moral and responsible sense are imperfect copies. The multitude of objects of sense, being involved in perpetual change, are deprived of all genuine existence. The number of the forms is defined by the number of concepts which can be derived from the particular objects of sense. The following excerpt may be representative of Platos middle period metaphysics and epistemology, Since the beautiful is opposite of the ugly, and since they are two, each is one. And the same account is true of the just and unjust, the good and the bad, each of them is itself one, but because they manifest themselves everywhere in association with actions and one another, each of them appears to be many. The lovers of sights and sounds like beautiful sounds, colors and everything fashioned out of them, in fact, there are very few people who would be able to reach the beautiful itself and see it by itself. What about someone who believes in things, but doesnt believe in the beautiful itself. Dont you think he is living in a rather than a wakened state. Isnt this dreaming, whether asleep or awake, to think that a likeness is not a likeness, I certainly think that someone who does that is dreaming. Book VI of the Republic identifies the highest form as the Form of the Good, the cause of all other Ideas, conceptions derived from the impressions of sense can never give us the knowledge of true being, i. e. of the forms. It can only be obtained by the activity within itself, apart from the troubles and disturbances of sense. Athens is the capital and largest city of Greece. In modern times, Athens is a cosmopolitan metropolis and central to economic, industrial, maritime. In 2015, Athens was ranked the worlds 29th richest city by purchasing power, Athens is recognised as a global city because of its location and its importance in shipping, commerce, entertainment, international trade, culture and tourism. 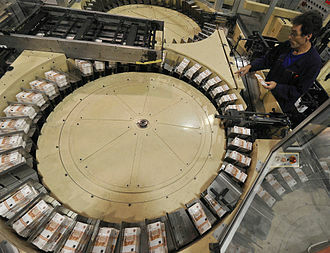 It is one of the biggest economic centres in southeastern Europe, with a financial sector. The municipality of Athens had a population of 664,046 within its limits. The urban area of Athens extends beyond its administrative city limits. According to Eurostat in 2011, the Functional urban areas of Athens was the 9th most populous FUA in the European Union, Athens is the southernmost capital on the European mainland. The city retains Roman and Byzantine monuments, as well as a number of Ottoman monuments. Athens is home to two UNESCO World Heritage Sites, the Acropolis of Athens and the medieval Daphni Monastery, Athens was the host city of the first modern-day Olympic Games in 1896, and 108 years it welcomed home the 2004 Summer Olympics. In Ancient Greek, the name of the city was Ἀθῆναι a plural, in earlier Greek, such as Homeric Greek, the name had been current in the singular form though, as Ἀθήνη. It was possibly rendered in the on, like those of Θῆβαι and Μυκῆναι. During the medieval period the name of the city was rendered once again in the singular as Ἀθήνα, an etiological myth explaining how Athens has acquired its name was well known among ancient Athenians and even became the theme of the sculpture on the West pediment of the Parthenon. The goddess of wisdom and the god of the seas, Poseidon had many disagreements, in an attempt to compel the people, Poseidon created a salt water spring by striking the ground with his trident, symbolizing naval power. However, when Athena created the tree, symbolizing peace and prosperity. Different etymologies, now rejected, were proposed during the 19th century. Christian Lobeck proposed as the root of the name the word ἄθος or ἄνθος meaning flower, ludwig von Döderlein proposed the stem of the verb θάω, stem θη- to denote Athens as having fertile soil. Civil wars and executions continued, culminating in the victory of Octavian, Caesars adopted son, over Mark Antony and Cleopatra at the Battle of Actium in 31 BC and the annexation of Egypt. 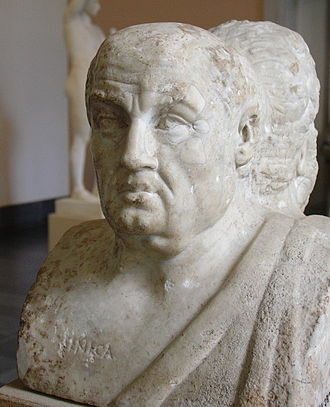 Octavians power was unassailable and in 27 BC the Roman Senate formally granted him overarching power, the imperial period of Rome lasted approximately 1,500 years compared to the 500 years of the Republican era. The first two centuries of the empires existence were a period of unprecedented political stability and prosperity known as the Pax Romana, following Octavians victory, the size of the empire was dramatically increased. 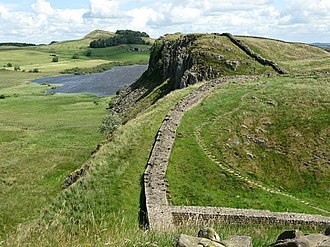 After the assassination of Caligula in 41, the senate briefly considered restoring the republic, under Claudius, the empire invaded Britannia, its first major expansion since Augustus. Vespasian emerged triumphant in 69, establishing the Flavian dynasty, before being succeeded by his son Titus and his short reign was followed by the long reign of his brother Domitian, who was eventually assassinated. The senate appointed the first of the Five Good Emperors, the empire reached its greatest extent under Trajan, the second in this line. A period of increasing trouble and decline began with the reign of Commodus, Commodus assassination in 192 triggered the Year of the Five Emperors, of which Septimius Severus emerged victorious. The assassination of Alexander Severus in 235 led to the Crisis of the Third Century in which 26 men were declared emperor by the Roman Senate over a time span. It was not until the reign of Diocletian that the empire was fully stabilized with the introduction of the Tetrarchy, which saw four emperors rule the empire at once. This arrangement was unsuccessful, leading to a civil war that was finally ended by Constantine I. Constantine subsequently shifted the capital to Byzantium, which was renamed Constantinople in his honour and it remained the capital of the east until its demise. Constantine adopted Christianity which became the state religion of the empire. However, Augustulus was never recognized by his Eastern colleague, and separate rule in the Western part of the empire ceased to exist upon the death of Julius Nepos. Yale University is an American private Ivy League research university in New Haven, Connecticut. Founded in 1701 in Saybrook Colony to train Congregationalist ministers, it is the third-oldest institution of education in the United States. The Collegiate School moved to New Haven in 1716, and shortly after was renamed Yale College in recognition of a gift from British East India Company governor Elihu Yale. Originally restricted to theology and sacred languages, the curriculum began to incorporate humanities and sciences by the time of the American Revolution. In the 19th century the school introduced graduate and professional instruction, awarding the first Ph. D. in the United States in 1861 and organizing as a university in 1887. Yale is organized into fourteen constituent schools, the undergraduate college, the Yale Graduate School of Arts and Sciences. While the university is governed by the Yale Corporation, each schools faculty oversees its curriculum, the universitys assets include an endowment valued at $25.4 billion as of June 2016, the second largest of any U. S. educational institution. The Yale University Library, serving all constituent schools, holds more than 15 million volumes and is the third-largest academic library in the United States, Yale College undergraduates follow a liberal arts curriculum with departmental majors and are organized into a social system of residential colleges. Almost all faculty teach courses, more than 2,000 of which are offered annually. Students compete intercollegiately as the Yale Bulldogs in the NCAA Division I – Ivy League, Yale has graduated many notable alumni, including five U. S. Presidents,19 U. S. Supreme Court Justices,20 living billionaires, and many heads of state. In addition, Yale has graduated hundreds of members of Congress,57 Nobel laureates,5 Fields Medalists,247 Rhodes Scholars, and 119 Marshall Scholars have been affiliated with the University. Yale traces its beginnings to An Act for Liberty to Erect a Collegiate School, passed by the General Court of the Colony of Connecticut on October 9,1701, the Act was an effort to create an institution to train ministers and lay leadership for Connecticut. Corpus Christi College, one of the constituent colleges of the University of Cambridge. Chapin Hall at Williams College in Williamstown, United States, one of the oldest liberal arts colleges. King's College London, established by a Royal Charter in 1829, is one of the founding colleges of the University of London. Graduation ceremony on Convocation day at the University of Oxford. The Pro-Vice-Chancellor in MA gown and hood, Proctor in official dress and new Doctors of Philosophy in scarlet full dress. Behind them, a bedel, a Doctor and Bachelors of Arts and Medicine graduate. The University of Bologna in Italy, founded in 1088, is the oldest university, the word university (Latin: universitas) having been coined at its foundation. Meeting of doctors at the University of Paris. From a medieval manuscript. 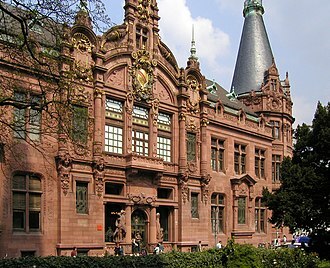 Heidelberg University is the oldest university in Germany and among Europe's best ranked. It was established in 1386. Jean-Henri Dunant, author of A Memory of Solferino. Sestertius of Antoninus Pius (AD 140–144). It celebrates the betrothal of Marcus Aurelus and Faustina the Younger in 139, pictured below Antoninus, who is holding a statuette of Concordia and clasping hands with Faustina the Elder. President Barack Obama talks with Hawking in the White House before a ceremony presenting him with the Presidential Medal of Freedom on 12 August 2009. Richard Rummell's 1906 watercolor landscape view, facing northeast. 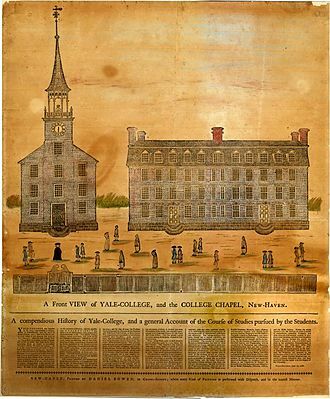 A Front View of Yale-College and the College Chapel, Daniel Bowen, 1786. Center of the campus in 1891. An aerial photograph of the center of the Stanford University campus in 2008. 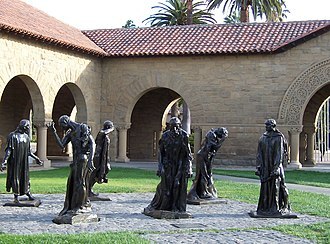 Bronze statues by Auguste Rodin are scattered throughout the campus, including these Burghers of Calais. President George Washington, the university's namesake. The historic Ray House serves as the residence of the President of the George Washington University. International Monetary Fund headquarters is behind it. University Yard is GW's largest open space in Foggy Bottom. GWU's Corcoran School of the Arts and Design is housed in the Corcoran Gallery, D.C.'s oldest private cultural institution, located on The Ellipse, facing south of the White House. A Sopwith Camel aircraft rests on the Front Campus lawn in 1918, during World War I. Soldiers' Tower, a memorial to alumni fallen in the World Wars, contains a 51-bell carillon. Old Vic, the main building of Victoria College, typifies the Richardsonian Romanesque style. The Munk School of Global Affairs encompasses programs and research institutes for international relations. Tondo of the Aison Cup, showing the victory of Theseus over the Minotaur in the presence of Athena. Theseus was responsible, according to the myth, for the synoikismos ("dwelling together")—the political unification of Attica under Athens. The Roman Agora and the Gate of Athena in Plaka district. A model of the old High Street Building, in the Hunterian Museum. The University of Glasgow in 1650. The new buildings of the University of Glasgow at Gilmorehill, circa 1895. 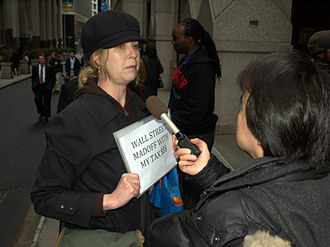 A protester on Wall Street in the wake of the AIG bonus payments controversy is interviewed by news media. 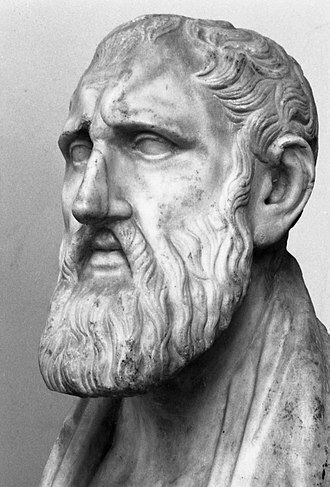 Zeno of Citium, bust in the Farnese collection, Naples – Photo by Paolo Monti, 1969. 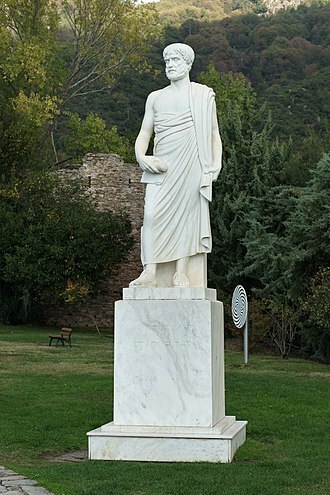 A statue of the dictator Julius Caesar. 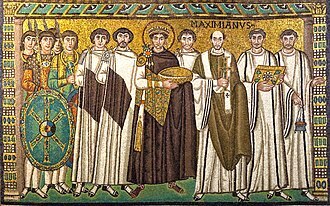 Under Justinian I, reigning in the 6th century, parts of Italy were for a few decades (re)conquered from the Ostrogoths: thus, this famous mosaic, featuring the Byzantine emperor in the center, can be admired at Ravenna. 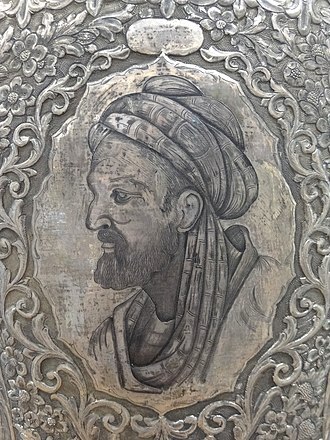 Agostino Veneziano's engraving of Ottoman emperor Suleiman the Magnificent wearing his Venetian Helmet. Note the four tiers on the helmet, symbolizing his imperial power, and excelling the three-tiered papal tiara. This tiara was made for 115,000 ducats and offered to Suleiman by the French ambassador Antonio Rincon in 1532. This was a most atypical piece of headgear for a Turkish sultan, which he probably never normally wore, but which he placed beside him when receiving visitors, especially ambassadors. It was crowned with an enormous feather. 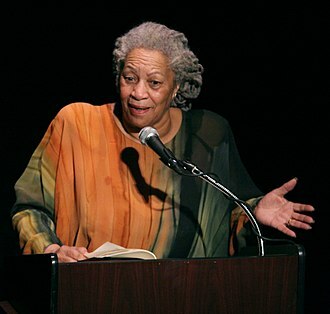 Toni Morrison, Emeritus Professor at Princeton University. Professor Moriarty from the Sherlock Holmes story "The Final Problem"
American Cancer Society offices in Washington, D.C. 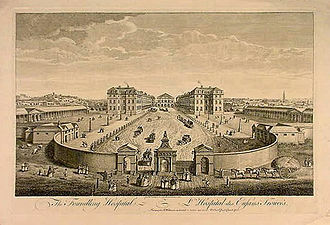 The Foundling Hospital. The building has been demolished. Andrew Carnegie's philanthropy. Puck magazine cartoon by Louis Dalrymple, 1903. A blood collection bus (bloodmobile) from Children's Hospital Boston at a manufacturing facility in Massachusetts: Blood banks sometimes use a modified bus or similar large vehicle to provide mobile facilities for donation.